Collegiate-gothic wood panels, a matching china cabinet stocked with warmly tinted salmon and blue plates, a wallpaper frieze evoking an endlessly rolling copse… A pleasing air of big-house formality and anticipated social gaiety pervades this dreamy circa 1909 scheme for a private dining hall. It’s one of the class assignments Izabel M. Coles (1890-1964) completed to earn her diploma at the Cooper Union Woman’s Art College. In 1953, she donated the watercolor to her alma mater with five other examples of her decorative drafting. 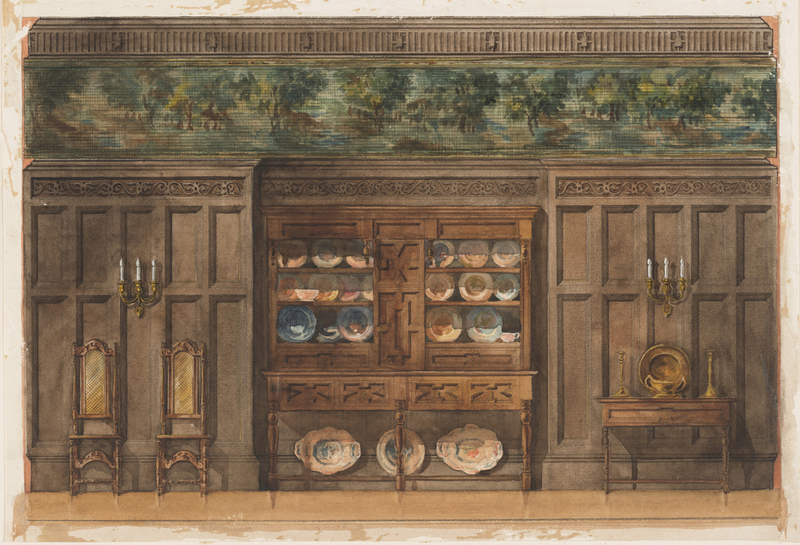 Coming of age between Teddy Roosevelt and the Great War, Coles was only 16 when she quit her piano study to prepare for the course in “Drawing from the Antique and Life, and Decorative Design” offered at the institute. A teacher at her high school who’d seen “a sense of color and proportion which ought to be developed” had encouraged her to apply. After separating from Izabel’s father in the 1890s, Izabel’s mother, Hester, reverted to her family name, Coles — and her daughter followed suit. Mother and daughter moved into the Coles family rowhouse at 29 Beekman Place, where young “Isabelle” (as she was then called) practiced her piano scales. Her forbears had done well in business on Long Island and in New Jersey. Her mother’s father and uncles owned a Hoboken factory that produced most of the school chalkboards in the northeast; her great-grandfather’s rich sister, Elizabeth Underhill Coles, had bequeathed dozens of “modern masters” paintings and Renaissance tapestries to the Met. Her first jobs were at a rug company (“for the munificent salary of $5 a week!”) and assisting an interior decorator (“wider scope as well as more money”). She hadn’t put personal adornments out of her mind, however, and sought out Mrs. William H. Klapp, a well-known society jeweler who put Coles to work designing all of her new mountings. After her employer died, Coles gave interiors a second try—her biggest commission was a pair of Persian-themed panels for a New York home. Then Tiffany & Company offered her an opportunity to go back to designing jewelry. For eight years she fashioned stock pieces and special orders for the firm, overlapping with Meta K. Overbeck who supervised Louis Comfort Tiffany’s artistic jewelry department. In 1934, Coles teamed up with Beth Sutherland (who’d trained with Ottavio Negri, one of the last master gem carvers in New York) for a joint exhibit of Sutherland’s intaglio portraits and bejeweled frames designed by Coles, at the Berkshire Museum in Pittsfield, MA. The last public glimpse of Coles’ work was a group show of contemporary jewelry organized by the Museum of Modern Art in 1946. Seen alongside works by Anni Albers and Alexander Calder, Coles’ designs—constructed out of enameled safety pins and other practical, everyday material— struck many viewers as both futuristic and primeval (and still do). Coles married a widower in her middle age, and retired to Florida. Apart from a piece from the Berkshire show (now in the Metropolitan Museum of Art collection), Coles’ output has been difficult to trace. A portion of her jewelry archive surfaced briefly on Antiques Roadshow in 2009 but hasn’t made an encore. How lucky, then, that at the close of a career focused on adorning necks, hands and wrists, Coles remained true to her school—returning her apprentice work so future students could enjoy and compare the historical styles and motifs so entrancing to earlier generations. Quotations from Coles come from Izabel M. Coles. Interview with Marion Clyde McCarroll. The New York Evening Post, December 20, 1928. “Little Jewellers,” p66, The New Yorker Dec 3, 1932. Readers may also like to know that “Isabelle M. Coles” is listed as receiving her diploma from the Woman’s Art School in Cooper Union Annual Report (June 1912). She received a Silver Medal (top honor) as a Third Year student in Decorative Design and Second Prize ($5) in Decorative Design for the best designs for the corner of a room in perspective, of the Louis XVI period, France. The 1911 annual report lists Coles as recipient of The Ethel Cram Memorial Fund Prize for the best upright decorative panels in the style of the latter half of the 18th century, period Louis XVI, France. That same year, she also received First Honorable Mention prize in Decorative Design for the best designs of an interior in the style of Robert and James Adam. Drawing, Side elevation of a dining room, ca. 1909. pencil and watercolor on paper. 1953-30-5.